Project obstacles and solutions: In a move to comply with new effluent limitation requirements from the EPA, Indianapolis Power and Light (IPL) announced in 2014 that they were building a new advanced wastewater treatment facility at their coal-fired power plant in Petersburg, Indiana. 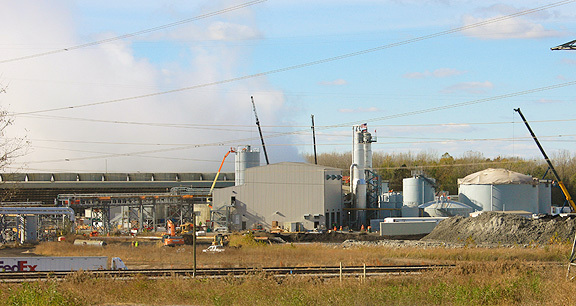 The facility treats flue gas desulfurization wastewater discharge in a way that none of it is leeched into the water systems surrounding the plant. The wastewater uses a brine concentration (evaporation) technology that enables all of the water to be recycled for re-use in the plant. Indiana Water Partners (IWP) is a joint venture between Bowen Engineering and Burns & McDonnell, who served as the site manager during the construction process. The Petersburg project called for over 35,000 yards of concrete. The early foundation work included drilling and filling caissons to a depth of 40 feet. Berkel and Company did all of the drilling work on the site. IMI supplied over 14,000 yards of flowable auger cast concrete at 5,000 psi for these caissons. The floors and walls of the holding tanks and clarifiers were specified to be poured with a mix incorporating a Type V cement, which has a high sulfate resistance. Since the facility is designed to isolate and remove sulfates from the burning of coal, a sulfate-resistant concrete was very important. However, Type V cement created a large expense in the production of concrete. IMI QC/QA worked with engineers from IWP and IPL to come up with a mix that incorporated fly ash instead of the Type V cement. Extensive testing was done at the IMI QC labs to prove the sulfate resistance of the new mix. The walls of the water-holding structures used a crystalline water-proofing admixture. In the hottest days of the summer, the concrete was cooled with iced-water in the mix. When large amounts of concrete are poured, the heat from cement hydration can cause the core of the mass to get too hot and cause cracks. Cooling the concrete kept this from being a problem. IMI QC/QA also added hydration stabilizers to slow the set time to allow the concrete to cure slowly. IMI supplied 22,000 yards of concrete for the floors and walls of the facility. The new Petersburg wastewater facility is on schedule to be operational in 2017. For more information on concrete for water treatment facilities, contact the sales representative for the concrete plant nearest your location. Click here.